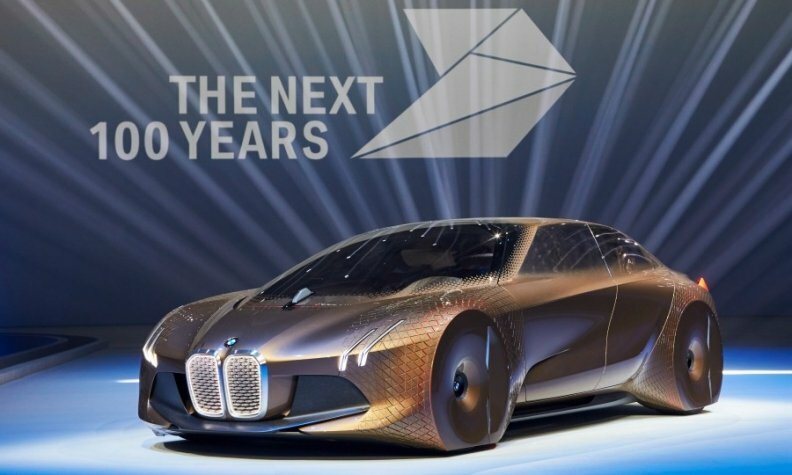 BMW's iNext self-driving EV will arrive in 2021. MUNICH -- Inside a bright auditorium at an abandoned airfield near Munich, rows of men and women gaze at images flashing by on a giant screen: a Mercedes sedan; Porsche and Jaguar SUVs; the face of Elon Musk. "We're in the midst of an electric assault," the presenter intones as the Tesla chief's photo pops up. "This must be taken very seriously." The audience is composed of BMW Group employees flown in for a combination pep rally/horror film intended to make them afraid about the future of the industry. The takeaway: The market is shifting in ways that were unimaginable just a few years ago, and BMW must adapt. The subtext is a recognition that the company has gone from leader to laggard. For years, BMW set the benchmark in luxury, but it needs to push to fend off resurgent rivals such as Mercedes-Benz and new competitors like Tesla. "BMW is falling behind in electrics," says Ingo Speich, a fund manager at Union Investment. Since January, the carmaker has taken 14,000 engineers, marketers, and factory managers, about 10 percent of its workforce through day-long events to prepare them for a time when customers may order a robo-taxi by app instead of buying a car. In a temporary building at a BMW test track, they participate in workshops and discussions of car-sharing apps, laser sensors, and batteries. In the corners, BMW shows off the vehicles it sees as key to its future: a self-driving iNext with a retractable steering wheel; a Rolls-Royce whose roof and sides swing open to allow a comfortable exit; a Mini designed for sharing that changes colors to suit the driver's mood. "It's easy to fall into a closed way of thinking," says Jutta Schwerdtle, a session leader who works in market research. "This helps push people out of that." The training effort comes amid concerns that CEO Harald Krueger isn't doing enough to address the challenges. Although BMW continues to post record revenue and profits, it lost the sales crown to Mercedes last year, and high-profile executives at the vanguard of new technologies have departed: Two leaders of its electric initiative moved to a Chinese e-car startup, and top designers have decamped for rivals as the German company has become less daring with new models. It's struggled to build interest in a revamped version of its high-end 7-series sedan, and the styling of the 5 series is meek in contrast to an aggressive makeover at Mercedes. "We're either part of this shift, or it goes on without us," says Wolfgang Ober, who presented workshops on ride-hailing giants such as Uber Technologies and China's Didi Chuxing. BMW was an early convert to electric cars, introducing its first standalone battery-powered model, the i3 compact, in 2013 and the plug-in hybrid i8 coupe a year later. Lately, though, it's focused more on under-the-hood conversions of existing vehicles, and sales of its electrics have trailed the likes of Tesla and the Nissan Leaf. BMW is planning only two new battery-powered cars by the end of the decade, and its first self-driving model isn't due until 2021. Tesla, which is gearing up to challenge BMW's 3 series with its forthcoming Model 3, already offers "autopilot," and Mercedes this fall will introduce an upgraded S-class sedan that it says can self-navigate anything from country lanes to autobahns at speeds exceeding 200 kph (120 mph). "BMW has lost its leadership in innovation," says Juergen Pieper, an analyst at Bankhaus Metzler in Frankfurt. "It's not brave enough to get into pioneering projects and do something really new." That heightens the importance of the iNext, a low-slung sedan with butterfly doors on view at the pep rally. Under bright spotlights, attendees peer at the prototype, its kidney-shaped grille jutting forward, looking a bit like rabbit teeth. The self-driving electric car will replace the 7 series as the company's flagship in 2021, Krueger said last year. Nonetheless, BMW will rely on the 7 series and other traditional combustion-engined models for many more years to finance the transition. The rally begins with a recorded presentation from Krueger viewed with virtual-reality goggles, an extravagance intended to stress the importance of adopting new technologies. The virtual Krueger exhorts participants "to put all your effort and energy" into the transformation. After a lunch of smoked haddock, semolina dumplings, and kale, the energy falters. Staffers sitting on unstable foam cubes in a stuffy room for a session on autonomous cars have no questions when question and answer time rolls around, even though their jobs may depend on understanding such systems. Still, Michael Manz, who develops sensors for self-driving cars, says the event is helping him better grasp BMW's mission and created a renewed camaraderie. "We were reminded of what we're trying to achieve," he says, sipping a pomegranate iced tea between sessions. "It gets us focused on where we're going."